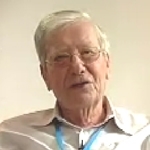 Video interview with Nicolaas Bloembergen, USA, who shared half of the Nobel Prize for Physics in 1981 with Arthur Leonard Schawlow, USA "for their contributions to the development of laser spectroscopy"
Recorded in 2004. In this interview Bloembergen tells how he is attracted to major challenges and found physics the most challenging subject at school. He chooses the most difficult things to do – for instance sport! He discusses the technical developments of his work on lasers and masers and gives an insight into various applications of his work eg: Distant early warning radar used to defend the USA, by Penzias and Wilson in their discovery of cosmic microwave background, the microwave mazer and microwave transmission via satellites. He goes on to talk about the Strategic Defence Initiative (SDI) set up during Regan’s administration as a defence against the Soviet Union. His advice to young scientists is to pursue something that interests you or don’t do science! Last but not least he discusses his views on religion!